Telenor has introduced this new limited time package (for 17 days), that offers inexpensive calls and even free calls at daily rental of Rs. 8.37 per day. Telenor has done it again – i am equally surprised this time too as they have not mentioned Daily Rental of Rs. 8.37 (including tax) on advert. At the same time, they mentioned the activation process, then how come they couldn’t put daily rental information on advert. One more thing that I couldn’t comprehend – there is this Free Calls package too, Telenor TalkShawk Har second, which allows Free on-net calls from 10 AM to 5 PM again same rental (8.37 including tax), but there is no information about it on ad. Maybe, they don’t want customers to opt Har Second Package and make free calls. Daily Subscription is required – meaning that you need to subscribe for this package daily. 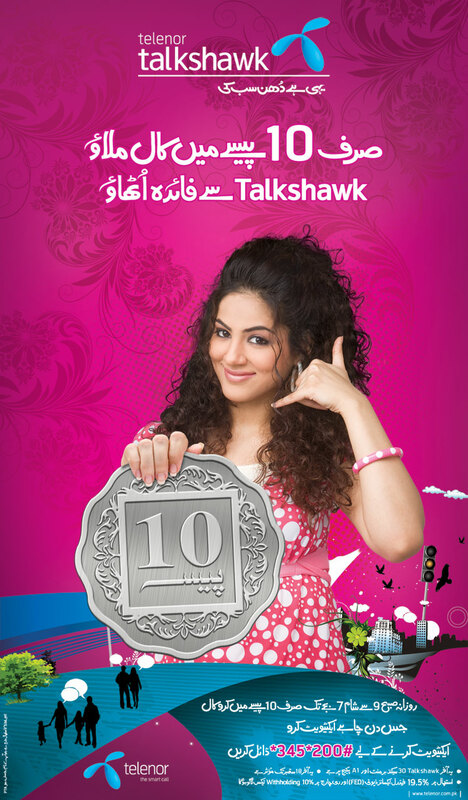 Customers on Talkshawk 30 second, Talkshawk Har Minute & Talkshawk A1 can avail this service. Update: Telenor has added a line in their ad about Daily Subscription charges, that’s a positive step. Hopefully they will keep up this practice. Aamir dear this is very old news and people have been DISCUSSING it in Propakistani Forums. Also, your competitors covered this news as soon the offer was launched. Bro – this package just got launched, and hence covered as soon as it happened…! Hi i activate talkshawk har second packg. And i also active this daily rental offer. But i am unable to make free call. On making calls to telenor num my balance deduct. This code and other codes have been disabled now…! But the code of Zong is still working very well! I have checked *100# for Zong. its working fine. I can check my balance free of cost. plz yar inform me about the free checking balance code of zong and telenor. plz yar ye zong k free balance checking ka code snd kardo. Free packages Free evils daily in our account. plz es ka time zeada kar dain 24hrs kar dain. ya koi esa 24hrs free package announce karain jo tama telnor number pe free call ho. i appreciate your this offer. Ye telenor ka free pakag ramazan main bhi activate krvaskte hai kya? plzzz ap MMS or free SMS ka koi tareeka batain k kis tarahn ye sim par activate hongay plz. Media Our Sim Networks Companies Pe Barosa Tabahe Ka Bayes Ban Sakta Han.